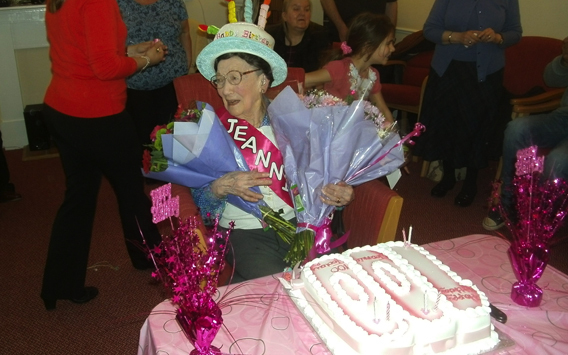 This month PEP’s Dunedin club at Royston Mains Close hosted a very special birthday celebration; Jeannie Ramage turned 100 years young. Surrounded by her family friends and fellow club members, Moira took out all the stops to provide a fun filled afternoon for the birthday girl. The room was decorated specially and a fantastic 100th birthday cake was kindly donated by Greggs the Baker at Boswall Parkway. There was also a buffet lunch, and Ronnie the entertainer was there to make sure everyone got up, sang and danced. Jeannie also had the chance to open all the wonderful gifts from family and friends. It was a great afternoon for everyone involved and we all wish Jeannie many more happy years.